Looks like the universe is already working on getting it's Halloween decorations in order. At the moment, a so-called "death comet" with the appearance of a human skull is speeding into our line of sight. It's actually not referred to as a "death comet" because of the skull however, rather due to the fact that the interstellar hunk of rock is believed to have been long dead. 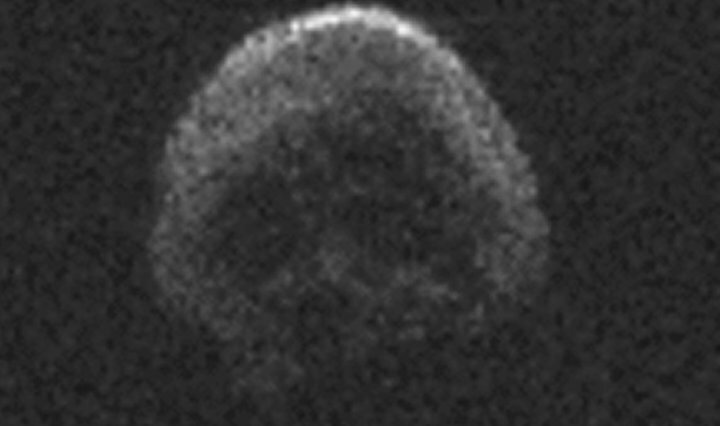 The skull shaped "death comet" will fly by Earth November 11th, shortly after Halloween. Ironically, the skull-shaped celestial body last appeared on Halloween 2015 and is set to whip past again on All Soul's Day, November 1, of the year 2088. The comet is officially named 2015 TB145, but NASA also refers to it as the "Halloween asteroid," "The Great Pumpkin" and, of course, "death comet." The asteroid has flown too close to the sun to have any capacity for life, but in place of volatile compounds it has a Jack o' Lantern style glow that is owed primarily to the fact that it's surface reflects light due to it's asphalt like makeup. Interstellar faces are really nothing new, from the man in the moon to recent never before seen regions of Pluto. Mars is well known for the "face" found on Cydonia near the Arandas and Bamberg Craters. The small face on Mars has been theorized to be proof of an ancient civilization on the red planet. Apart from that there's also the giant "happy face" crater on Mars (the Galle Crater). Even Pluto was shown to have a sort of "face" on it's dark side, a face some find suspiciously similar to the Disney character Pluto. oh i was ready to die, how disappointing. maybe next time?